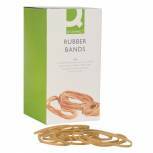 Q-Connect Rubber Bands No.38 152.4 x 3.2mm 500g KF10544 Pack of 1 Q-Connect Rubber Bands. High quality bands with a high latex content ensuring use time and time again. Extra value 500g box. No.38 - 152.4 x 3.2mm (6 x 1/8). 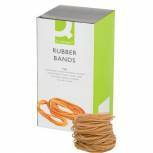 Q-Connect Rubber Bands No.69 152.4 x 6.3mm 500g KF10554 Pack of 1 Q-Connect Rubber Bands. High quality bands with a high latex content ensuring use time and time again. Extra value 500g box. No.69 - 152.4 x 6.3mm (6 x 1/4). 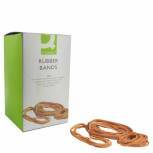 Q-Connect X-Bands Assorted 100g KF14679 Pack of 1 Q-Connect X-Bands. Stretches four ways to secure files and packages. More secure than string and easier than two rubber bands. 100 gm box of assorted colours. 100mm diameter. Q-Connect Rubber Bands Assorted Sizes 500g KF10577 Pack of 1 Q-Connect Rubber Bands. High quality bands with a high latex content ensuring use time and time again. Extra value 500g box. Assorted sizes. 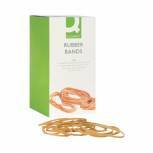 Q-Connect Rubber Bands Assorted Sizes 100g KF10673 Pack of 1 Q-Connect Rubber Bands. High quality bands with a high latex content ensuring use time and time again. 100g box. Assorted sizes. 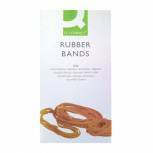 Q-Connect Rubber Bands No.89 152.4 x 12.7mm 500g KF10573 Pack of 1 Q-Connect Rubber Bands. 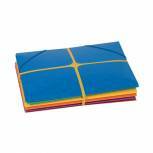 High quality bands with a high latex content ensuring use time and time again. 500g box. No 89 - 152.4 x 12.7mm (6inch x 1/2inch). Size 38 Rubber Bands (Pack of 454g) 9340008 Pack of 1 Rubber bands for fastening. Designed to be used over and over. Supplied in clear packaging. Pack contains 454g of rubber bands. Size 38 (160mm x 2mm). Colour: Natural. 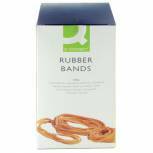 Q-Connect Rubber Bands No.36 127 x 3.2mm 500g KF10542 Pack of 1 Q-Connect Rubber Bands. High quality bands with a high latex content ensuring use time and time again. Extra value 500g box. No.36 - 127 x 3.2mm (5 x 1/8). 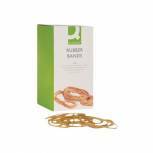 Q-Connect Rubber Bands No.64 88.9 x 6.3mm 500g KF10549 Pack of 1 Q-Connect Rubber Bands. High quality bands with a high latex content ensuring use time and time again. Extra value 500g box. No.64 - 88.9 x 6.3mm (3 1/2inch x 1/4inch). 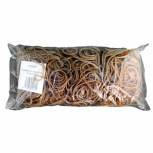 Q-Connect Rubber Bands No.63 76.2 x 6.3mm 500g KF10548 Pack of 1 Q-Connect Rubber Bands. High quality bands with a high latex content ensuring use time and time again. Extra value 500g box. No.63 - 76.2 x 6.3mm (3in x 1/4). 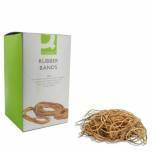 Assorted Size Rubber Bands (Pack of 454g) 9340013 Pack of 1 Rubber bands for fastening. Designed to be used over and over. Supplied in clear packaging. Pack contains 454g of rubber bands. Assorted sizes. Colour: Natural. 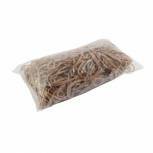 Q-Connect Rubber Bands No.65 101.6 x 6.3mm 500g KF10550 Pack of 1 Q-Connect Rubber Bands. High quality bands with a high latex content ensuring use time and time again. Extra value 500g box. No.65 - 101.6 x 6.3mm (4inch x 1/4inch). 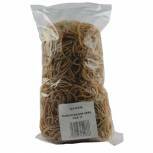 Size 18 Rubber Bands (Pack of 454g) 9340015 Pack of 1 Rubber bands for fastening. Designed to be used over and over. Supplied in clear packaging. 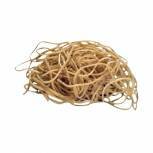 Pack contains 454g of rubber bands. Size 18 (76mm x 1mm). Colour: Natural. 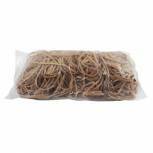 Size 36 Rubber Bands (Pack of 454g) 9340017 Pack of 1 Rubber bands for fastening. Designed to be used over and over. Supplied in clear packaging. Pack contains 454g of rubber bands. Size 36 (120mm x 2mm). Colour: Natural.